The span of the Nan Bei (South North) Elevated Highway that crosses over Suzhou Creek is as wide as it is long. Instead of carrying utility lines under the deck, a water main and other utilities are carried on tubular steel tied arches on each side of the bridge. 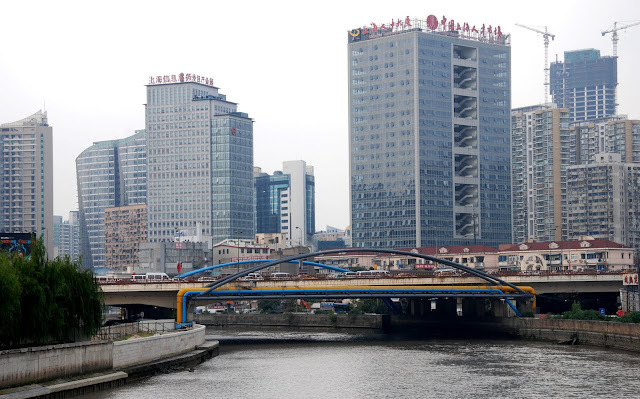 This portion of the elevated highway is a continuous, reinforced concrete girder bridge over Suzhou Creek. The Nan Bei Elevated Highway creates a boundary between old and new Shanghai, between the upper and lower Suzhou Creek, and between the downtown and midtown areas. Elevated highways act as a boundary between the rich and poor, they're noisy (especially without soundwalls), and they block one's view. However, they are probably optimal in high rise neighborhoods. Shanghai, China's Bridges: Nan Bei Elevated Highway by Mark Yashinsky is licensed under a Creative Commons Attribution-NonCommercial-ShareAlike 3.0 United States License.